Zhao Xue (pictured) of China completed a fantastic victory in the Nalchik Women's Grand Prix, demolishing the opposition to finish a full 2½ points ahead of the field. Even a last round loss to her compatriot Ju Wenjun barely dimmed the magnitude of Zhao Xue's achievement to score 9½/11. Ju Wenjun finished second, and Ekaterina Kovalevskaya third, but the event belongs to Zhao Xue! There will now be a break for a few months until the next Grand Prix in the series, which takes place in June 2012 in Kazan, Russia. The best overall player from the series of 6 Grand Prix tournaments will become the challenger for the 2013 Women's World Championship. The regulations for the 2011/12 Grand Prix can be found here. The winner in each of the tournaments will receive 6,500 euros out of a prize fund of 40,000 euros, with the overall winner getting a further 15,000 euros. 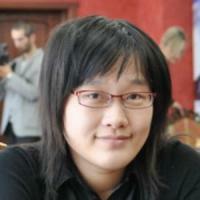 The current women's world champion Hou Yifan won the first two Grand Prix events, in Rostov and Shenzhen. Pictures from the official website.